Given the innumerable choices one has when it comes to hard drives these days, you’d wonder which one you should get. We might have some answers. Not much is discussed about mechanical hard disk drives these days. SSDs and other flash memory based devices have taken the centre stage and ends up getting all the attention while mechanical hard drives sulk away in the corner. Both mediums of storage are pretty much commodities and the general opinion is that there’s hardly any difference between two mechanical drives. So it’s only natural for consumers to ponder as to why manufacturers have decided to bifurcate such a storage medium. Take WD (Western Digital) hard drives for instance, their line up of internal hard drives have branched out into multiple sub-brands, each catering to a certain usage scenario. And for the sake of simplicity, WD uses names of colours to identify different sub-brands. There’s Blue for normal usage, Black for enthusiasts, Green for power saving, Red and Red Pro for non-stop 24x7 usage, Purple and Purple NV for surveillance and Gold for Data Centres. The Green lineup has been since last year, folded into the Blue lineup and are only distinguishable by their model numbers and spec sheets. There are actually a lot more than just these, the lineup for Data Centres claims to offer even more reliability than consumer products and come at a pretty high price tag as well. But we aren’t concerned with those and are going to focusing on what we have at hand. Even the competition which includes Seagate, Toshiba and HGST, all have similar offerings across different usage scenarios but we must admit that WD has a much easier to understand naming system than the convoluted alphanumeric numbering that everyone else does. So exactly how different are these devices when it comes to performance? We decided to call for a few drives from one brand, i.e. WD in this case to figure it out. Needless to say, we only had these drives for a few weeks and performing long term endurance tests would have possibly taken months, if not years. So while we don’t have numbers about longevity, we do have a few insights about performance. The best approach to comparing drives would have been if we’d received drives of the same capacity across all sub-brands. Unfortunately, we had to make do with whatever we had on hand. Do note, these are claims made by WD and do not reflect benchmarks, we’ll get to that in a later. From the specifications and the data sheets, it becomes evident that the Black drives no longer come in 10K RPM SKUs which pretty much ruled the roost up till a few years back. But with the fact that SSDs have become really popular, this move does make sense. WD Red Pro and WD Black seem to be the fastest among the ones that we received for testing and this comes at a price, literally. Also, these drives consume a lot more power than the others. All other specification seem to be within the vicinity of each other, so it’s doubtful if there’ll much performance difference because of these. Speaking of performance, here’s what we did with these drives. We hooked up all the drives to our test rig and proceeded with our usual set of storage benchmarks. The drives were all connected to the SATA ports connected to the Intel Chipset to avoid any inconsistencies. Each drive was zero-written to ensure a fresh start and then benchmarks which required a RAW drive were run. Post RAW benchmarks, the drives were initialised under GPT and then partitions were created for the remainder of the tests which required data to be transferred. 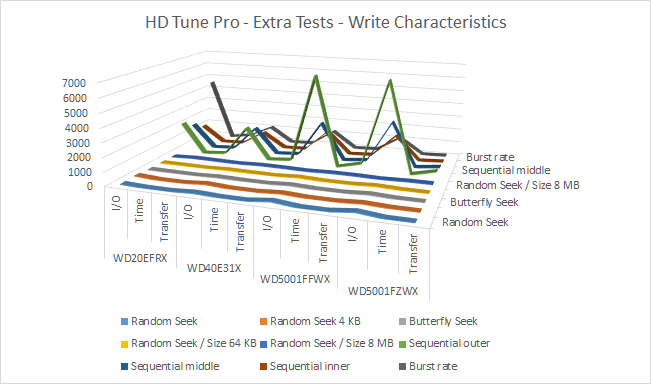 We used, HD Tune Pro for the initial set of benchmarks because of it’s easy to use interface and the fact that it has a plethora of read/write tests using different file sizes. 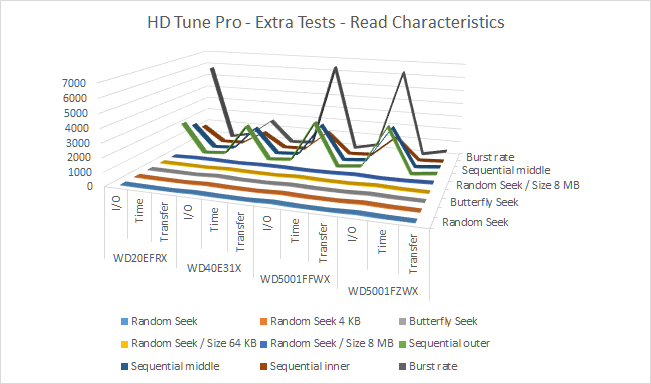 We then progressed to the industry standard PCMark8 for running application trace tests and ended the run with the all-time favourite IOMeter which was used to see if the IOPS trace tests matched what had been earlier observed with HDTune. The first benchmark was a simple read and write speed test using HD Tune Pro. Straight off the bat you’ll notice that the drives with the higher RPM and higher cache were consistently ahead of the other two drives. We’re, of course, talk about the WD Red Pro and the WD Black drives. 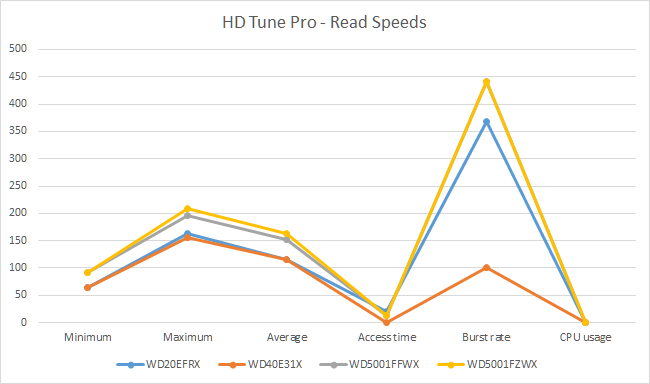 The Black Drive performs significantly better than the other drives and the WD Blue SSHD shows no increment in read speeds. The WD Blue we have here is an SSHD and would have in real world tests performed slightly better thanks to caching. The much older WD Red shows a remarkable increase in burst read speeds. It is bested only by the WD Black drive which remains the consistent leader. The HD Tune Pro write speed tests paint a similar picture with the two 7200 RPM drives having much higher minimum, maximum and average write speeds. The WD Black, again performs much faster than the rest. Again, the WD Red seems to do better than the other 7200 RPM drive with burst write speeds. The WD Red Pro maintains a clear lead across all other metrics in the write speed tests with regards to the WD Red drive. This graph may seem a bit confusing at first and that’s just normal for data graphs traced along three dimensions. It depicts the number of operations the drives could handle within a time period along with data transfer rates. Since these are physical drives, the IOPS scored by individual drives were very less. And since most of the tests were random, the WD Blue SSHD couldn’t cope with the remaining drives. 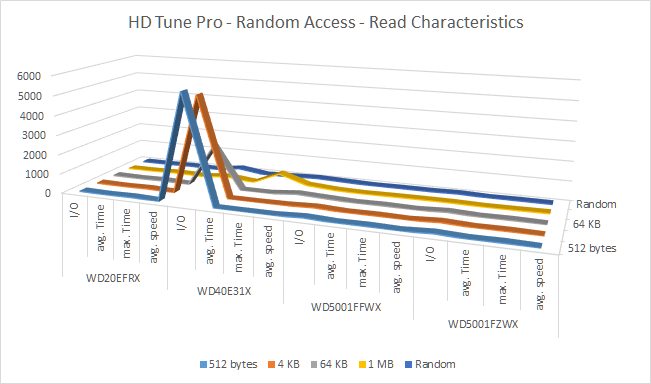 All drives performed well with regards to sequential data transfers with the WD Black and WD Red Pro scoring the highest. And between the two, the WD Black had slightly better numbers overall. With regards to the write characteristics, we see that Burst rates are more or less within the vicinity of each other with the WD Red outperforming all other drives. As for Sequential data transfer, the WD Black again, surfaces as the better drive and the WD Red Pro is only behind by a sliver. The results of this particular benchmark were a little surprising. And we had to redo this after having swapped SATA slots just to be sure. Turns out that the WD Blue SSHD drive is a lot better than the others at Random reads across varying file sizes. The bigger the file size, the better the performance. The IOPS figures corroborate this particular trend as the numbers went up into the thousands while all other drives would only score in the tens. This can only be attributed to the 8 GB NAND memory on board the hybrid drive. Unfortunately, the same performance was not recorded in the Random write tests. 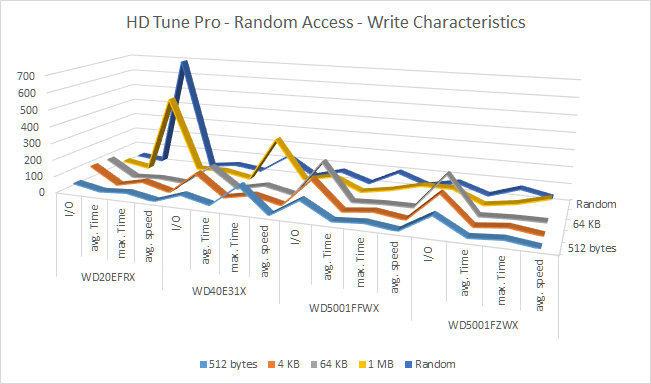 The WD Red drive showed huge spikes in access times which isn’t a good thing for any drive. Even the other 5400 RPM drives. The numbers for all drives were all over the place and didn’t result in any discernable pattern. Before you look at the graphs, you should note that the first two graphs indicate scores which, if higher, is better. While all other graphs record time consumed per test and the lesser the number, the better the drive. 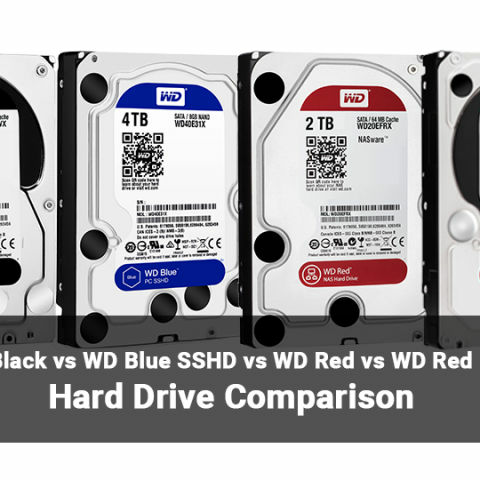 While the WD Blue SSHD emerges as the overall winner purely due to the 8 GB NAND, the fact remains that the WD Black and the WD Red Pro outperformed all other hard drives with consistently lower time taken for trace benchmarks. The older WD Red simply couldn’t catch up to the remaining drives. While we did want to calculate cost of ownership while factoring cost of individual drives and electricity consumption, we simply could not do so accurately as we did not have possession of the drives for long enough to accrue data necessary for such calculation. We could have easily calculated these figures based on the data sheets of the drives provided, but the fact is that some of these drives have variable RPM which results in varying power consumption over any time period and to get proper estimates, we’d have to hook em up and monitor power figures for months at ends. The WD Black comes as a clear winner across the board except for when the WD Blue SSHD screeched past thanks to its hybrid design. The WD Red Pro performed consistently well and was only second to the WD Black. While the WD Red did come quite close to the remaining drives, it simply could not match up primarily because of the lower RPM and cache memory size. All the other drives had a significant advantage, either in form of faster spindle speed or hybrid design. The WD Red and Red Pro drives are designed for a different usage scenario altogether and we simply cannot opine about the durability since we did not have the drives around for long enough to run prolonged tests to benchmark durability. It would be prudent to conclude at this point that one should stick to a WD Blue SSHD and pick a WD Black only if consistently high performance is needed. Given the fact that SSDs are more affordable, it hardly makes sense to pay nearly double for a WD Black when the same money can be invested in an SSD.